Finding a cure for Amyotrophic Lateral Sclerosis – ALS – and supporting those afflicted with the disease and their families is a cause that drew both young and old to Marco Island recently. The reason was the first annual “Cindy’s ALS Odyssey Walk” fundraiser, which benefitted the ALS Association Florida Chapter. Held at Mackle Park, the event drew about 80 walkers and raised $5,500 for the organization. Commonly known as Lou Gehrig’s disease, ALS is an incurable and progressive neurodegenerative disease that affects nerve cells in the brain and the spinal cord. As the disease progresses, voluntary control of muscles is lost, eventually relegating sufferers to a wheel chair and even affecting their ability to do such things as speak, before ultimately resulting in death. 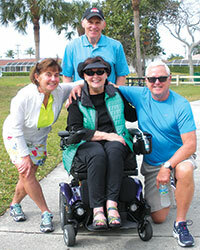 The namesake of “Cindy’s ALS Odyssey Walk” is Cindy Amerine, 69, a Naples resident who was diagnosed with the disease in November of 2014 after a roughly two-year-long battery of tests and exams that were required to identify the difficult to diagnosis malady. 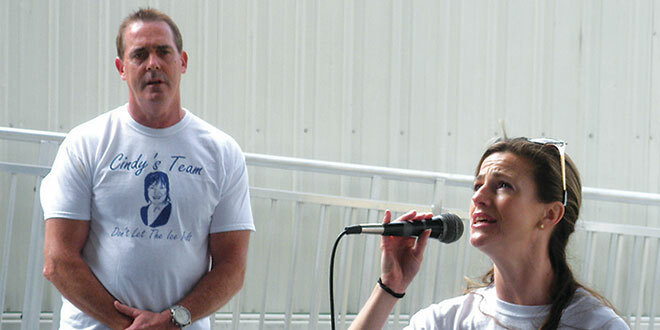 ALS patients at the walk, Kent Dickerson of Marco and Madeline Kennedy of Bonita Springs. It was her friend, Mary Jo O’Regan of Marco, assisted by her husband Michael, AKA “Moose,” who was the walk’s chief organizer. “We will defeat ALS and that’s why we’re here today,” Mary Jo O’Regan announced to the crowd shortly before the walk began. Her friend, Helen Donaghy, of Marco, was among the walkers. Marco resident John Barrett was accompanied by 21 people, some from as far away as Bonita Springs, that he recruited to take part in the event. “I lost my wife three years ago to ALS so I brought a group of people,” he added. Club also took part in the walk and helped to raise funds for the event. MIA junior Kendall Feehan said she learned of the walk during a Key Club meeting. “I just thought that if I had the opportunity to help people out, why not use my free time to help people in need,” she said. Mary Jo O’Regan also treated the attendees with a rousing, live rendition of “The ALS Odyssey Anthem,” for which Cindy Amerine composed the lyrics and Moose O’Regan, the melody. A video of the song can be found at www.youtube.com/watch?v=4_PMmSRkcQY. She and Cindy Amerine were overjoyed with the turnout and the donations. For more information about ALS, visit www.alsa.org and www.webfl.alsa.org.